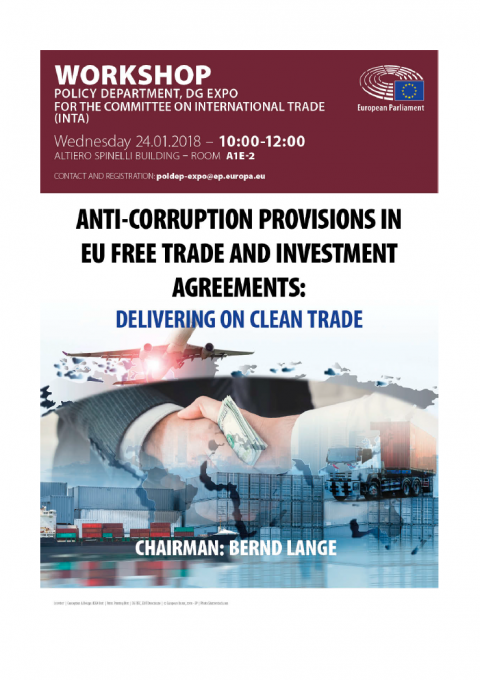 Anti-corruption provisions in EU free tradeand investment agreements: Delivering on clean trade. What is the connection between trade and corruption? What is the mechanism linking the two, according to empirical evidence? What is the most recent practice in regard to free trade agreements and anticorruption provisions that should be considered by the EU when designing its own strategy for the future? What is the evidence concerning the performance of pure anticorruption provisions, not directly related to trade, in the form of international conventions and treaties against corruption, seeing that their inclusion in trade agreements is increasingly recommended? What are the options for the EU, seeing that it is also the world’s largest development donor, giving aid to more than 110 of the countries it trades with? The evidence for this brief report is on the one hand based on secondary sources, as organizations such as the OECD or the Bretton Woods institutions have been researching this subject for quite some time, while on the other hand it is based on original research funded by the EU’s own Seventh Framework project ANTICORRP (anticorrp.eu) which is dedicated to anticorruption.